Have you ever wondered about the local impact of trade tariffs? Or the social cost of carbon emission? From local budget analysis to military reports on global warming, government documents offer a wealth of knowledge from local, state and federal levels. They make sense of our world and help us plan for our future. Government Documents: Use the Past to Plan Your Future offers guidance on searching within the SuDocs classification system and highlights some of the fascinating and useful items found within the Libraries’ government documents collection. The exhibit is located in the University Downtown Center (UDC) Library on the first floor of the UDC in downtown Binghamton. It will be on display August 23-December 16, 2017. 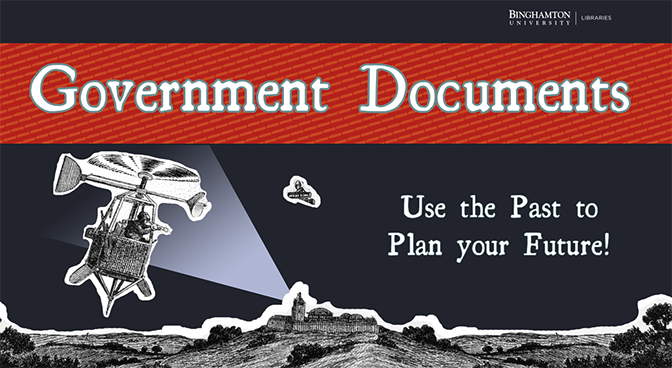 View our online Government Information guide for more information about government documents. Visit Exhibits to view our exhibit schedule. Image: Advance Sentinel in a Helicopter. This entry was posted in Blog, Exhibits, General News, libraryhomepage, UDC library and tagged Exhibit, Government Documents. Bookmark the permalink.